When your argument is poor or backed by no science or truth, a useful way of responding to criticism is to attempt to stifle the criticism. 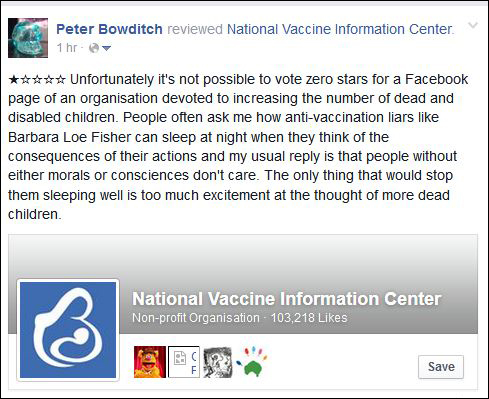 It is axiomatic that the arguments put forward by anti-vaccination liars are poor and unscientific, so it comes as no surprise to find that Barbara Loe Fisher of the deceptively-named National Vaccine Information Center should respond to criticism of her and her child-endangering activities by calling in the lawyers. She is suing Dr Paul Offit, journalist Amy Wallace and Condé Nast (publishers of Wired magazine) for telling the truth about vaccines. You can read the legal filing here. The article in Wired which so offended Ms Fisher can be seen here. I'm not a lawyer, but I suspect that Ms Fisher is not taking action to recover damages or to protect her reputation (which is that of a promoter of disease, death and disability anyway), but to silence the defendants, cost them money, and divert their time from their real jobs to spending time in court. Plaintiff Barbara Loe Fisher is the cofounder and acting president of the National Vaccine Information Center ("NVIC"). 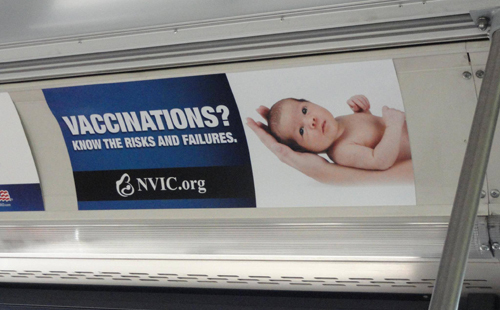 NVIC is a non-profit organization founded in 1982 and dedicated to the prevention of vaccine injuries and deaths through public education and to defending each patient's right to voluntary, fully informed consent to vaccination. Publicly active on issues concerning mandatory vaccination and harms linked to vaccines for the past 28 years, Plaintiff Fisher is a public interest advocate, public speaker, media source for information about mandatory vaccination and harms linked to vaccines, and author of books and articles. She has been consulted repeatedly by public health agencies, including those of the federal government agencies, on those same issues. That certainly sounds like a prominent public figure to me. The other thing I have been told about US defamation law is that truth is a defence. If Ms Fisher doesn't like being called a liar and someone who endangers the lives of children then she should stop publishing lies about vaccines. Does she really want her dubious "science" to be closely examined in court? Somehow I don't think so. 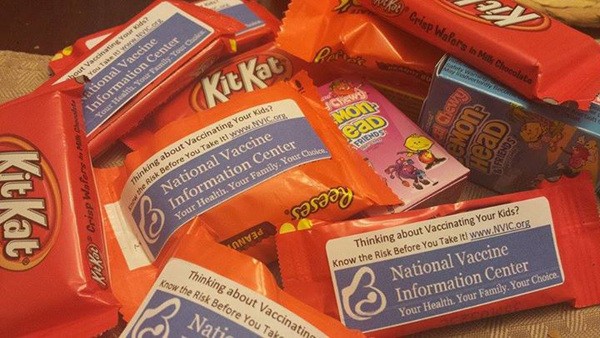 The National Vaccine Information Center spreads deliberate lies about the dangers of vaccines. The fact that these lies are deliberate is demonstrated by the fact that contrary evidence from real scientists is either ignored or ridiculed. You, as principal of NVIC, are complicit in this campaign of lying and disinformation. 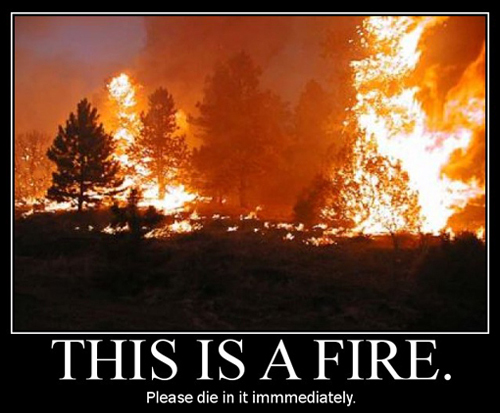 Your actions endanger the lives of children, and if you got your way then many children would die or suffer permanent damage. Your claim that you are not opposed to vaccination per se but just want it to be safe and for parents to be informed is a lie. Please state one vaccine that you believe should be given to all children. Can't? Won't? QED. You seem to want the right to denigrate people like Dr Offit, but you run to lawyers when someone criticises you. In the real world this is called hypocrisy. And you know what that makes you. If you manage to get Wired to remove the story from their web site I will reproduce it here. Then you can waste your time and money suing me.